When exercising, most people like to listen to music. It distracts from the burning in your legs or the fact that you are starting to feel a little out of breath. Plus, it can set the beat for you to run at, making it as fast or slow as you need to really feel the burn. All of this comes from a pair of headphones, and these are one of the most vital decisions you have to make when it comes to preparing for exercise. With more of us commuting to work and other places via bicycle, the need for a good pair of headphones has risen with it. After all, cycling the morning journey to work can be a little dull without some music playing in your ears. Here, we take a look at some of the best headphones for cycling, helping you to decide which ones you should buy. These earphones for biking have a sleek design and a comfortable fit. This is because they are incredibly lightweight and come with three different ear cup sizes. Plus, they fit very securely thanks to the comfy silicone in the actual ear bud – so no fear of them slipping out. These wireless headphones have 8 hours of constant playing and 300 hours of standby time when they are fully charged – more than enough for several days of commuting. Plus, the sound quality is fantastic, producing crisp sounds and allowing you to immerse yourself in the music. You don’t need to worry about losing signal either, thanks to the secure Bluetooth connection. This nifty pair of earphones is sure to have you cycling on to work without any hesitation. They have a comfortable fit, accommodate all ear sizes, and their battery life is absolutely fantastic. With a range of great Bluetooth features and brilliant sound quality, you don’t need to worry about losing connection with your music device. A great buy at a very low price. These sweatproof headphones aren’t going to slip off your head during a particularly difficult cycling trip. Even when it is covered in sweat, it will also remain just as comfortable as before, thanks to the silicone padding. 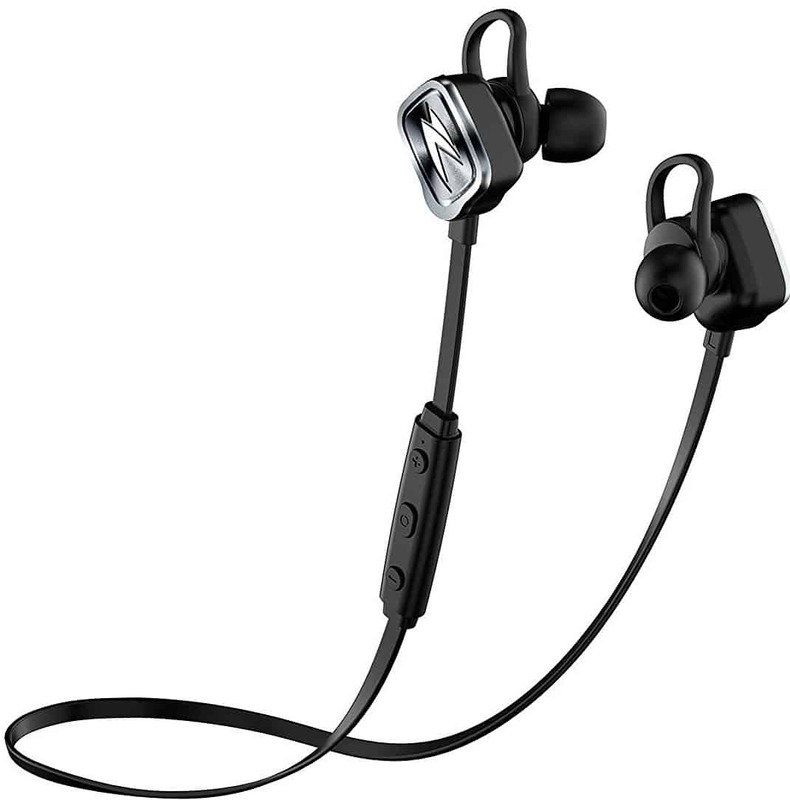 They also have a flexible, ergonomic design that is made to perfectly fit the contours of your ears – with a secure interchangeable earbud for different ear sizes. They have a great sound quality and deep bass, offering a fantastic experience while you are out and on the go. It also has Bluetooth installed as well as low power consumption, with a single charge providing 7 hours of music. If you are looking for a pair of cheap headphones for biking and enjoying the outdoors, then these might be the best ones for you. 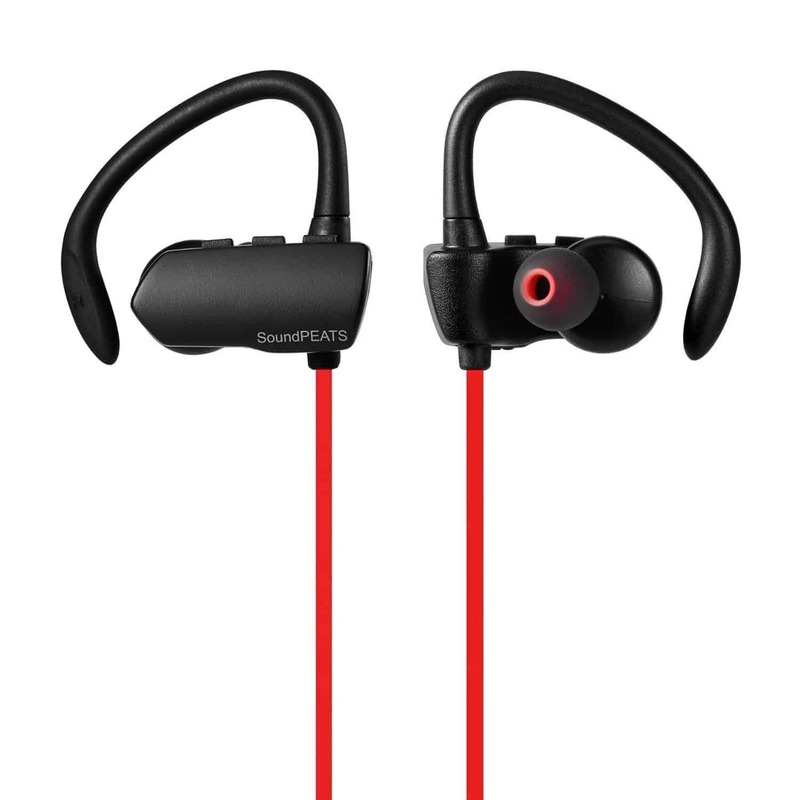 Sweatproof, and with a secure fit in your ears, they offer great sound quality and low power consumption so you can go through several days of commuting without worrying about the battery running out. While some have noted the life is not as long as advertised, these are very few and seem to be related to a faulty batch. Q: Are these at all foldable? Or is the main band reasonably flexible? I want to be able to fit them in my coat pocket when I'm not wearing them. A: The main band is completely flexible - so yes they would easily fit in a coat pocket. These wireless biking headphones wrap around the back of the head for a secure fit while you are on the move. They have been designed to endure even the toughest workouts while providing excellent comfort throughout. 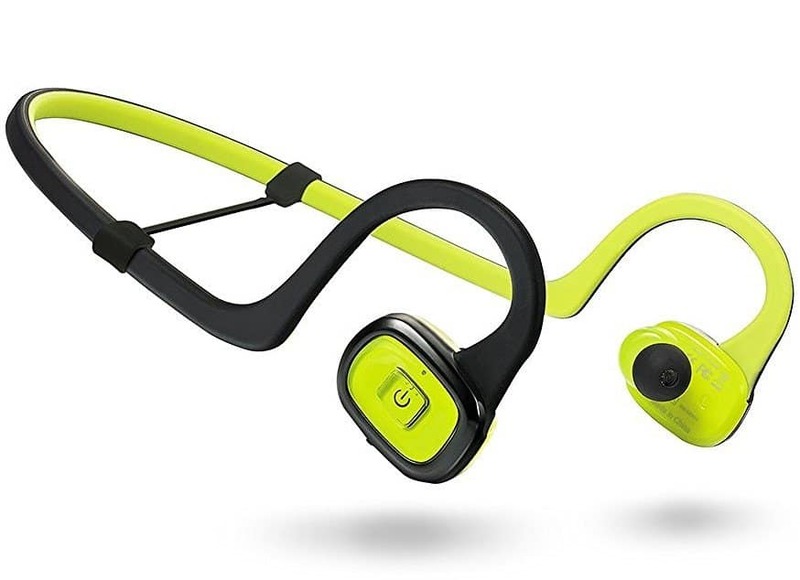 They have fantastic sound quality thanks to the nifty bone conduction design. Mini vibrations are conducted through the cheekbones and into the inner ear. This way, you can still listen to excellent quality music, but also be aware of your surroundings – they provide a great experience as well as added safety for you on your commute. Plus, the battery life is brilliant, offering you 6 hours of constant play time. 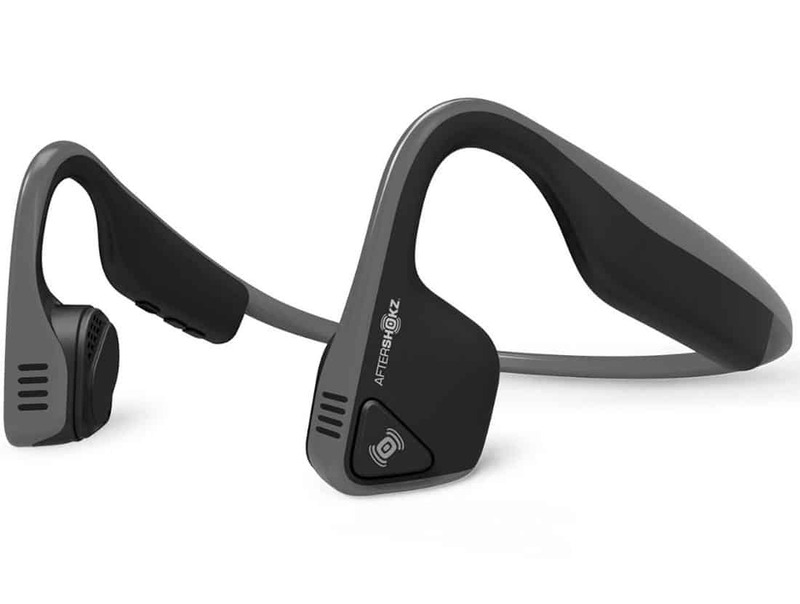 While developers are still working out the kinks of bone conduction technology, these headphones still offer an excellent music listening experience that is sure to have you feeling more motivated on your way to work. Wireless and secure, there is no need to worry about them falling off your head, and they are considered one of the best headphones for cycling. A great buy at a reasonable price. "They are light, easy to connect and control, and the sound is more than fit for purpose." - By Richard M.
These wrap around headphones have a secure fit round the back of the head and are also sweatproof for long cycles to and from work. The snug fit means that no matter how bumpy the ride, they aren’t going to fall off any time soon. They are also very lightweight, so you won’t feel them while you are riding. The hi-fi stereo offers superb sound and a smooth bass. With Bluetooth 4.1 for dual device listening, and a built in microphone for calls – leaving everything crystal clear. The battery provides 8 hours of listening time and 9 hours for calls, so it won’t be running out of charge any time soon. Plus, it has strong connectivity and they are very easy to use and set up. 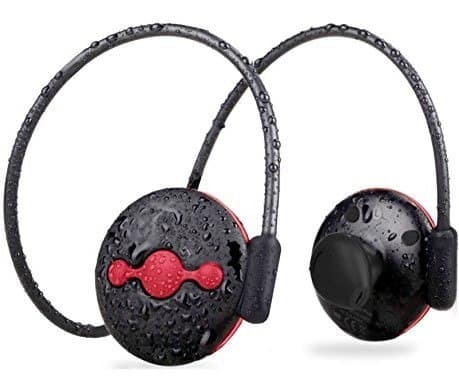 These headphones are great for those looking for a cheap entry to biking headphones, and the cycling headphones reviews for this model are generally quite favourable. While you are commuting to work, they will stick on your head, even though bumpy journeys, and they have a great battery life for longer commutes. Functional and with the latest Bluetooth, you can switch between your phone calls and music with ease, and without distraction. Perfect for those on a budget. These nifty Bluetooth headphones can connect to two devices at once for an even more diverse listening experience. It offers brilliant sound quality, and also allows to you switch easily between listening to music and taking phone calls. You can also adjust the volume and switch tracks – all without needing to touch your phone or music player. Plus, the microphone is built in. The ear hooks are there to keep the headphones securely on you, so you don’t need to worry about them slipping off while you are out exercising. Plus, it comes with three different sized buds for the ultimate fit. It can connect with almost any device, as long as they have Bluetooth enabled and ready to go. These headphones are affordable and produce an excellent quality of sound. They are ideal for those who are cycling to work due to the secure fit and range of handy Bluetooth features. With complete hands free, you can take important calls without needed to stop or losing concentration on the road. They are easy to use, and always ensure a fantastic end result. 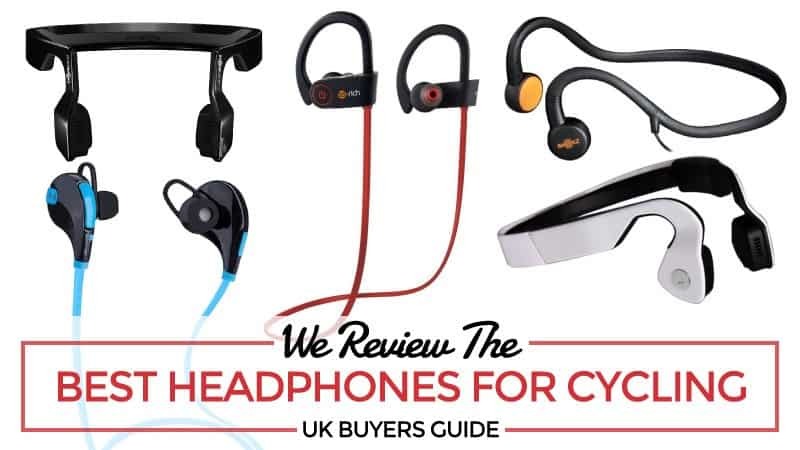 This selection shows you some of the best cycling headphones on the market – wireless and with a secure fit. Comfortable as well as reasonably priced, these are all fantastic models to pick from. You can go check them out and choose the best one for you on your commute to work or other locations. Your journeys will go faster than ever before with a pair of these on your head.